Image courtesy of Gotham/ GC Images The main cast of "Isn't It Romantic" poses together during the filming of their closing dance number. On Feb. 13, when everyone was gearing up for Valentine’s Day, “Isn’t it Romantic” premiered in theatres to challenge the status quo of love movies. While the movie does question the social norms of the Hollywood love story, it definitely still fills the shoes of a romance movie, but that’s because if it wasn’t everyone would be angry about the incomplete plot line. Also, if it didn’t follow the rules of a romantic comedy, then it truly would just be an anti-Valentine’s Day movie. Which is definitely not what it is. 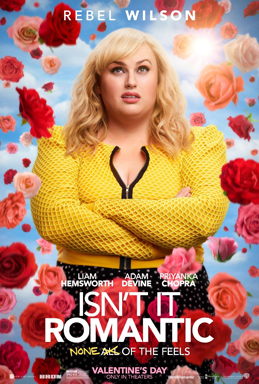 “Isn’t it Romantic” begins with Natalie (Rebel Wilson) knocking everything cliché about romance movies and setting the characters up to become the perfect love story. Rebel Wilson stars in “Isn’t it Romantic” to twist the standard rom-com love story. Then, as the trailer for the film shows, Natalie ends up in a perfect fantasy world where Liam Hemsworth is her destined love, she has the greatest gay sidekick (Brendon Scott Jones) in history and, of course, her best friend (Adam Devine). The movie breaks the fourth wall of all rom-coms and does it in the most beautiful way. Honestly, I could not stop laughing throughout this entire film. “Isn’t it Romantic” will be one of the most quotable movies, I think. Wilson presents her character with such quirk and charm that it is quite relatable. It shows the typical insecurities of women, the belief that they aren’t worth the rich, handsome guy’s time. Then she teaches us that self-worth and acceptance is the true love story. Overall, the film really hit it out of the park for me. It showed us how karaoke is really supposed be done, gave us some closure on how Fat Amy and Bumper are doing, and it will definitely take the award for most beguiling movie of 2019. I will most definitely go see this movie again with anyone and everyone.